Our Polar Bear Bracelet has long been a staple of our jewelry kits. 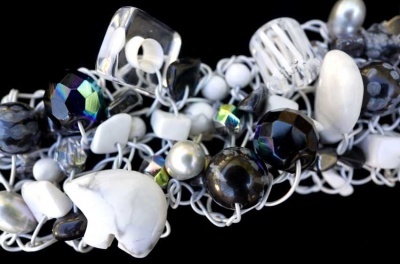 As beads go in and out of stock, especially the semi-precious stones, the overall look of the bracelet has changed. 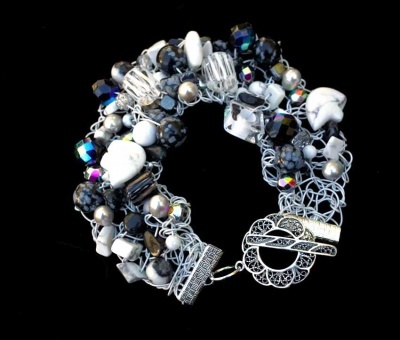 We have some gorgeous beads and chips and crystals in stock for making these beautiful bracelets. With a few exceptions, these mirror the original bracelets in most regards and will give you the same feel and look. 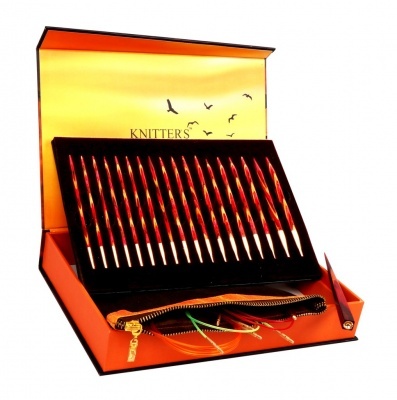 We are thrilled and delighted to be able to offer them. And while stocks last, we will be contributing 10% of profit to the Sierra Club to help with their efforts to keep the environment healthy for all the creatures of the planet. Fun, easy, and very special. 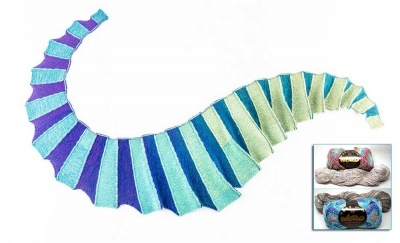 The Polar Bear Bracelet is a kit so that you (the knitter) could knit a chunky bracelet using semi-precious stones. This key is an extremely flexible wire -- called Flexrite 49 --- it is actually made up of 49 very thin thin thin strands of steel all together into one wire. Flexrite uses state of the art micro wire technology to produce a wire that is strong, soft, and flexible. The difference between knitting with this and knitting with "normal" wire is amazing -- it is actually closer to knitting with fiber than with wire. And it has a stretchability that works superbly as a bracelet component -- as well as being far more comfortable than regular wire. And what beads we found! 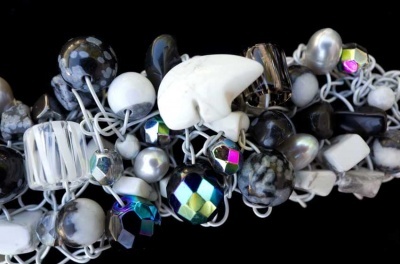 There are semi-precious beads and chips in Snowflake Obsidian, Howlite, and Hematite, plus dyed gray Pearls in a lovely tear drop shape and with a faint rainbow finish, And (the piece de resistance, in my opinion) some 12x18mm Howlite Bears, glorious silhouettes of polar bears to dance across your bracelet and bring a smile to your face. And to the mix we also add Fire Polish Crystals in varying sizes and colors to capture the light with its beautiful faceted crystal. We also managed to find some intriguing Hand-Blown Glass pieces in black, white, and crystal in a myriad of shapes ranging from slices to squares to cylinders to triangles -- really special. We will be including a few of these in every kit as well, as wonderful accent pieces. That is just to name the main pieces; we reserve the right to add more if something else strikes us. :-) You will likely have well more beads than you need for making a bracelet so you can pick and choose what appeals. 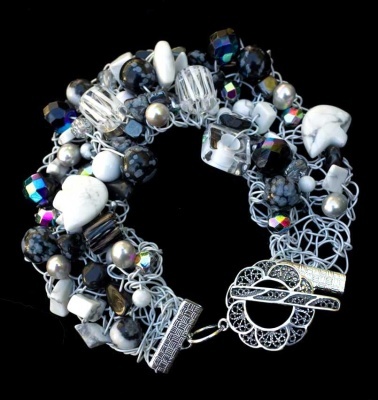 The overall look is a great mix of blacks and whites and grays and crystals. The look is of snow and rocks and ice with the bears striding across the landscape. 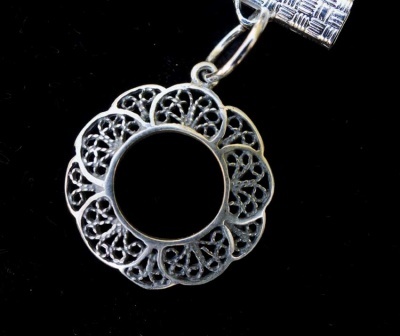 The clasp is a toggle style, of silvertone filigree to continue the idea of ice crystals. Each kit contains everything you will need to make the bracelet as you see it here (except the needles -- we used size 2) -- a 30 foot spool of the wire in silver color (silver plated over the steel), enough semi-precious stones to make one bracelet, and the pieces for finishing the ends and adding a clasp. For finishing we found some clamps that are silver plated -- you will need pliers to squeeze them tight -- and both split rings and split rings to join with lobster clasps. Looks great. We feel the split rings are safer than the jump rings though the jump rings are easier to use. We will be including both, more than needed and you can choose for yourself. . The bracelet is relatively heavy and definitely a chunky look -- it weighs a bit more than 2 ounces (about 60 grams). And I love it! We are thrilled to be able to offer it to you. I know some of you might already have made other bracelets of ours that are made along the same lines -- any of the Crystals and Wire bracelets we have carried in the past have used the same basic design pattern, the only real changes being the beads and the colors. If you feel you do not need another pattern, simply choose "No Pattern Needed." We think you will be very pleased.